A couple days ago, it was a friend of mine's birthday, so I offered to make him a cake. He asked me for a very chocolatey cupcake, but I don't like to make cupcakes, so I promised him a chocolate cake. I found this recipe, for which I already had all the ingredients, and that didn't seem too complicated to make. Well, let's just say that it is like the directions on items you buy for the house, you know, the ones you supposedly can assemble in 15 minutes but take you three days? You know by now that impatience is my weakness. So you'll be proud of me when I say I really took my time with the prep work, making sure I had everything ready. I even managed to stay neat. I made sure I followed all directions to the letter. I was also very excited to use my stand mixer. It worked like a charm, that's for sure. The cake is a genoise, a very light cake. It had a little bit of cocoa powder to make it chocolate. Ooops, I misread the ingredients. It called for unsweetened powder and I had only sweetened cocoa powder. Never mind, it worked. Next problem, the recipe does not specify what size pan to use, so I used an 8" springform pan. The baking took an extra 10 minutes from what the recipe says, but it came out beautifully. 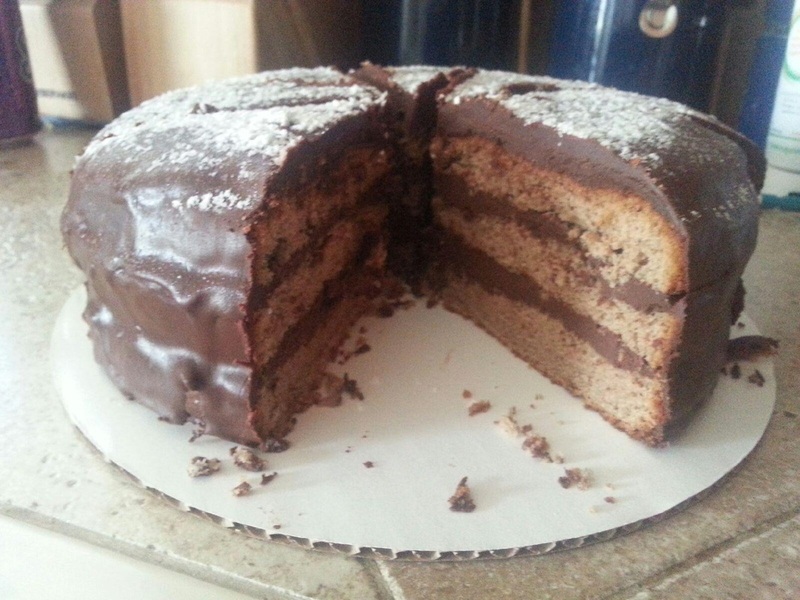 The filling is a ganache and the icing is also chocolate. The problems started when I tried to put it all together. All parts tasted delicious on their own (although I would not recommend eating too much of the ganache or icing, it's a bit much), which was already a big plus. Second problem: the ganache. Delicious! But I used almost all of it just for the first layer! So I scrambled to make more, doubling the original recipe since I needed to make two more layers of ganache. I ended up with a lot of ganache left over. Oh well... I would also maybe reduce the cream a little, just to have a slightly thicker ganache. Third problem, the icing. Same as with the ganache. I did not have enough and scrambled to make a second batch. Now this icing needs to be poured over the cake and supposedly will form a shiny smooth cover. I probably used the wrong chocolate, I also probably did not use enough of the oil, I used half the amount of the recipe. I still did not have enough to cover the whole cake. But the biggest problem was that this icing shows all the imperfections in the cake. Any suggestions on how to cut a cake in layers? Can you believe it has been almost 7 months since my last post?!?!? Crazy work schedule, a trip and a broken leg have prevented any baking since March. And I mean that: NO BAKING WHATSOEVER!!! Can you say "withdrawal"? Anyway, I am at a point now, where I can start walking around again and can stand in the kitchen instead of using the family as my personal servants and fetchers. And so I decided to start again. Some of you have been asking about the blog, so here I am. Please leave comments, they are always appreciated! I decided to start with a tried and true recipe, my country bread. I love it! It is so versatile. When it is fresh, it is delicious with just butter, jam, or chocolate spread. Use it for sandwiches, croque-monsieur or French toast. Toast it with your favorite topping (mine is goat cheese), use it for croutons or in bread pudding. The second project of the weekend was to revisit meringues. 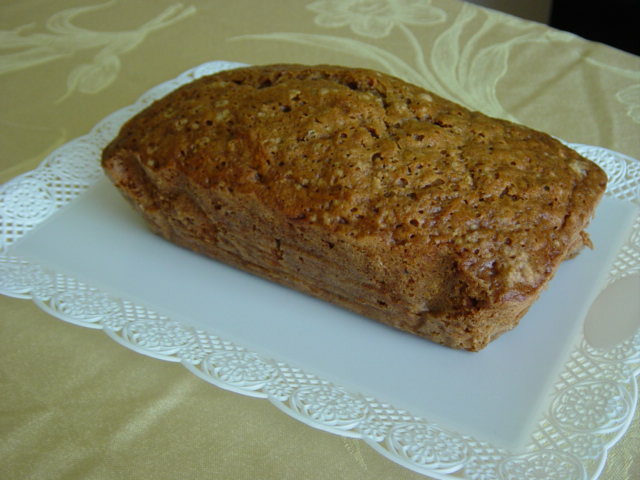 I tried a different recipe and, although the result tastes ok, it was not my favorite. I did not manage to get the mix stiff enough to pipe it the same way I did before. So I ended up with little buttons. They're cute and could easily be used for cake decorating. Right now, I made little sandwiches with chocolate ganache. And the final project of the weekend was my first attempt at making a cheesecake. This is my husband's favorite dessert and we had some of of those graham cracker pie crusts that needed using. I found a recipe on a French website that gave a wonderful result. My husband loved it. Lessons learned here: warm up the cream cheese before using for a smoother filling (although the end result did not show any lumps). I also need to figure out how to cut it neatly. I passed a knife under hot water after a couple cuts, and it helped, but do you have a better suggestion? So, let me know what you think. I cannot promise a weekly post, but I promise not to wait another 6 months! Happy baking! Wow, time flies! I didn't get to bake last weekend but I did do a few things this weekend. I have been wanting to do a recipe that I collected when I was in high school. We had one of those semester electives where we baked and cooked. Madeleines were made famous by Proust who would remember his childhood when smelling madeleines. Madeleines are recognizable by their ridges on one side and that little bump on the other side. My "bumps" were pretty mild compared to some pictures I've seen. I've read that a way to do this is to actually keep the batter in the fridge for a couple of hours, if not all night. Definitely something to try next time. There are many recipes for madeleines and the textures vary. They are delicious with a good cup of coffee, tea or hot chocolate. This recipe gives a very cake-like madeleine, reminiscent of the quatre-quart cake. Some people might find it too heavy, although the size should help with that. Preheat the oven at 435 degrees. Beat the eggs until you get a whitened mix. Add the cold melted butter. Butter and flour the molds. Put one table spoon of better in each mold. My daughter has been begging me to make a zucchini bread I made several years ago. It's amazing what stuck in children's minds. They can't remember what you asked them to do 10 minutes ago but can remember a cake from 3 years ago. I reduced the amount of sugar by 1 cup. I remember last time that it was quite sweet. This is a bit better. I have read in the past that one can use apple sauce to replace the oil and I think that is something I plan on doing next time. The cooking time was off. One of the cakes was done after 65-70 minutes, the other one took an additional 15 minutes. I don't know if it is due to the pan's material (the glass one took longer). The challenge this weekend was a recipe taken from the French show "Le meilleur patissier" (The best baker). The part that scared me: making caramel. It turned out to be easier than expected and the result is a divine gooey mess, a finger-licking-good sauce that makes you think about finding as many recipes as you can that need caramel. Although I try and keep the same quantities, some substitutions in the ingredients are unavoidable. For example, finding vanilla sugar here requires a trip to a specialty store. Make sure your pan is very clean. I used a medium sauce pan. Pour enough of the sugar in a pan to have a thin opaque layer on the bottom. Heat at low/medium heat. When the layer starts looking slightly transparent, add mode sugar. Keep doing this until all the sugar is in. Do not disturb the sugar with a spoon or anything. Let the sugar melt. When all the white is gone, you can start using a wooden spoon. Careful, sugar is very hot and can burn! In the meantime, boil the heavy cream. When the sugar is all liquid, remove from heat and slowly pour the boiling cream in it, while whisking it. Put it back on the heat and keep mixing until it thickens a little. A spoon dipped in it should come out covered. Add the salted butter and stir until thoroughly blended. Pour into a bowl, cover, let it cool then store in fridge. Mix the flour and the butter with your fingers to form a sandy mix. Add the sugar, vanilla and egg yolks. Bring the dough together, adding a bit of milk if necessary (I added 1 tbsp). Film the dough and put in the fridge for 15 minutes. Spread the dough to a 1/8" thick sheet. Using a cookie cutter, cut the cookies. In half of them, cut a circle in the middle. Bake at 350 for 9-12 minutes. When your cookies cool down, assemble them: put a little bit of caramel (careful, when warming up, it starts running) on the bottom cookie and cover with the top cookie, previously powdered. Do you have ideas of recipes using caramel? I was going through the blog, going back to the beginning. Can you believe it's already been 8 months and about 60 recipes (counting the failures)? While watching a French pastry competition, the candidates were required to make this croustade. Traditionally, the dough is stretched really thin over a large table, then rolled with the filling and then as a spiral (although comments on the recipe from people of that area say that the spiral shape was not typical). Needless to say, there was no way I would ever do that, I'm not crazy! Then one day, while looking through cooking/baking blogs, I came across this recipe. The author of the blog proclaims proudly to be a modern woman and using modern ingredients to make her life easier. And so, I decided to try it. I liked the idea of working with phyllo and the look of it, in my mind, allowed for the unavoidable tears in phyllo dough. So here I go. The results were mixed and there is lots of room for improvement but here are some notes. It looked beautiful! I just loved the top of the pastry, golden, delicate. It just was very pretty. I wonder if I put too much phyllo dough on the top and that's why it is not more uniform in the color. My daughter and I thought the taste of the orange blossom water was too strong, overpowering. I followed the recipe except I didn't use armagnac. Does this alter the taste of the orange blossom water? I don't know, but it was strong. On the other hand, my husband thought the taste was pretty bland. Go figure! I used the listed number of apples but ended up with only one layer of apples. Compared to the amount of phyllo dough, that might explain the blandness. I don't know if I used too big of a pie pan, but that needs to be rectified. I realized I forgot to use the sugar... Oooops! I had to bake it for 30-35 minutes instead of the 15-20 minutes mentioned in the recipe, just to get to the color. Again, is it due to the layer of phyllo? I'll use less orange blossom OR replace it with vanilla or even add cinnamom. See about using a different pie pan. What about your experiences with phyllo dough? I had some egg whites leftover, 6 of them to be exact, and I was looking for a way to use them. So I tried meringues. I was a bit leery but am I glad I made them. They are just DELISH!!!! I looked around for simple recipes, found one I could use but ended up modifying it. My final result is a keeper! Start beating the whites. When they start getting foamy, add the sugar a little at a time. Keep beating until firm and glossy. The egg whites should form a beak on the whisk when you remove it from the whites. Pour the preparation into a pastry bag with a large star shaped tip. 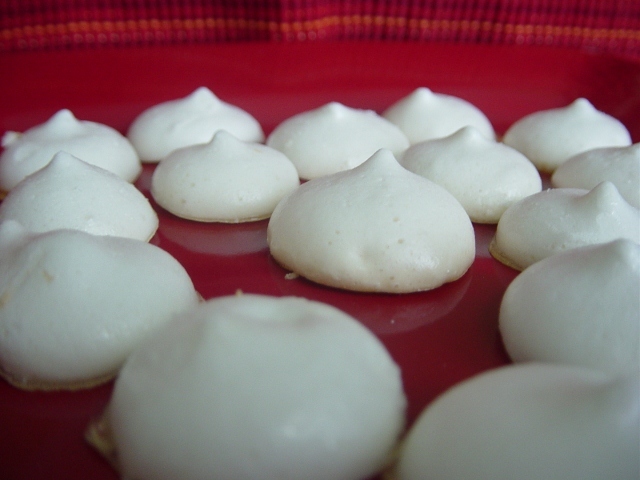 Place your meringues on a parchment-paper covered cookie sheet, about 1 inch apart. Put in the oven at 195 degrees for about 2hours. Some recipes called for the use of vinegar and cornstarch to guarantee the whitest meringues. Mine had a very light tan but it was uniform and glossy so not off-putting. The recipe I used as a basis was giving as baking directions: 20 min at 245 degrees and then one hour at 210. I followed that and I think that is where the tan comes from. I then looked it up some more and have determined that 195 degrees for 2 hours seems more the norm. Leave the meringues in your oven after you turn it off to continue letting them dry. I used granulated sugar. Many recipes seem to call for powdered sugar. Since powdered sugar has cornstarch in it, it might be a good idea to use it to maybe get that white meringue. I however do not regret my choice. This quantity is a lot. I have wasted half of it, following the dual temperature baking instructions. If baking everything at 195, I would keep baking all of them. As it was, half the quantity gave me about 75 bite-size meringues. These are basic meringues but it got me thinking of possibilities. So I will definitely be looking into this again. Have you ever made meringues? Do you have recipes to share? Last weekend's project was "eclairs". I needed to revisit the dough I used for the cream puffs AND the recipe for the vanilla cream used to stuff them. All in all, this week's experiments tasted really good, I just need to work more on the appearance side of things. I would say that my major fault here is my impatience. I just want to go too fast. What is frustrating is that I KNOW I am going too fast as I do it but I can't seem to slow myself down. This was particularly the case with the chocolate ganache in this case. 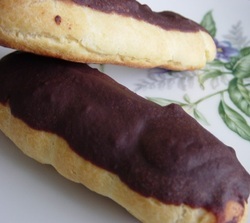 For the eclairs, I used this recipe, it is a basic recipe, pretty easy to accomplish. That was not the issue. However, I'm always amazed at how hard it is to deal with oven temperatures and length of baking. See, this recipe is used to make little cream puffs, eclairs and many more other items. Everything is different, different sizes, different thickness, so the temperature and length of baking will be different for each one. Now, as you are baking, it is not so hard to say "ok, a couple minutes more". What is hard though is to keep track of how you modify the time for the next time you want to do this. And I haven't even figured out how to play with the temperature. How do you know which temperature would be the best for your project? One of the lessons I had learnt from making the cream puffs was that the size of the batter you put on the sheet does not change much when baking, it doesn't rise and double volume or anything close to that. So I made sure my eclairs were close to the size I wanted in my final product. However, in my first batch, I poured the batter in a kind of rope and did a "folded" rope to ensure enough width. Well, the result was disappointing. The rope was not thick enough or high enough, which means those eclairs were flat. And the two parts of the rope did not mesh completely during baking, which gave me eclairs with a weird valley in the middle. This batch tasted good but looked horrible. So for the second batch, I kept the pastry bag closer to the baking sheet and made sure to pour more batter. Frankly, I could have gone even further. I should have ended up with a sausage-like batter about one inch thick. The other thing is how hard it is to keep that pastry bag steady and pour the batter in a uniform way. I ended up with some funky shaped eclairs. 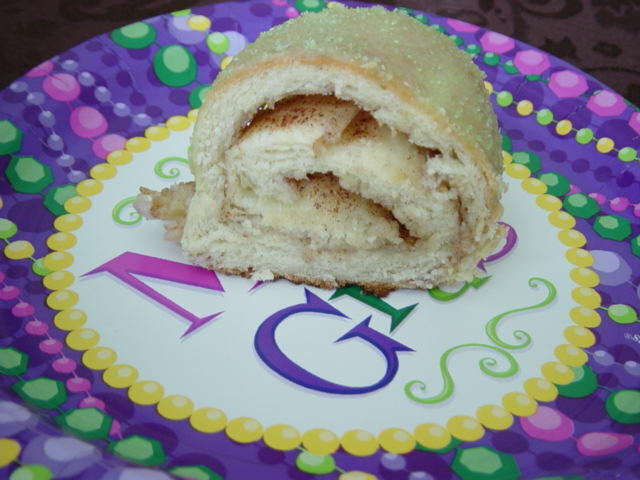 For the cream, I used the same recipe I used when I made the King Cake. The only mistake I made was once again due to my impatience. Small detail but it shows how important it is. I used the wrong measuring spoon to measure the vanilla extract and poured a bit too much of it. The cream tasted good otherwise, however, I think I'm looking for something that has more firmness to it, more thickness. Technically, this was the easiest part, just melt chocolate and mix with some heavy cream. Once again, my impatience got the best of me and my chocolate was grainy and my ganache a bit too thick. In the end, I'm glad to say I made eclairs. The taste was really good, so I know the recipes work, I just need to work on technique and appearance. and PATIENCE!!! What is your weakness when baking?